In celebration of UAE’s Year of Giving, Emirates Skywards’ annual Thanks a Million campaign has created yet another Miles millionaire while supporting a good cause. Thanks a Million campaign raises over Dhs 378,000 for the Emirates Airline Foundation to improve the lives of disadvantaged children. Ms. Menna Gadou was crowned the lucky winner of one million Skywards Miles. The runners- up, Mr Christopher Dias and Mr Craig Senior, received 500,000 Skywards Miles and 250,000 Skywards Miles respectively. The winners were chosen through a raffle draw which sold 18,000 tickets this year, raising over Dhs 378,000 for the Emirates Airline Foundation. The lucky winners will be able to use their Miles across the Emirates network on flights to over 150 destinations. One million Skywards Miles will allow one to travel from Dubai to Europe 22 times, 19 times to Asia or 13 times to the United States or Australia in Economy Class. 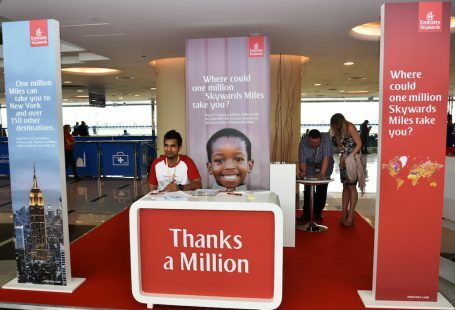 Emirates Skywards, the frequent flyer programme of Emirates Airline, has been running the Thanks a Million campaign since 2001, doing their part to give back to the community. Now in its 17th year, the Thanks a Million draw has raised over Dhs 4 million in ticket sales for various charities, including Riding for the Disabled Association of Dubai (RDAD), The World Food Program and the Emirates Airline Foundation. This year, the proceeds will benefit projects run by the Emirates Airline Foundation which aims to improve the lives of disadvantaged children, providing basics such as food medicine, housing and education. The winners were announced at the Dubai World Cup last Saturday where raffle tickets had been on sale on the day as well as via Ticketmaster in the month prior.